Welcome to the Online Trade Bike Museum. We love those old bikes that had to work for their living. Compare alley cats and house cats. Unlike their lucky cousins living a charmed existence pampered by their owners, delivery bikes carried goods and were usually ridden by employees rather than considerate owners. Many were leased to companies with repair guarantees that meant it didn’t matter how they were treated. From the earliest days of cycling, carrier cycles and commercial trikes were piled high with goods to be delivered by lads with strong thighs. In France, an early Labour Law prohibited boys under fourteen and women from riding them. If Marlon Brando had ridden a trade bike instead of a Triumph in ‘The Wild One’ things could have been so different. Gangs of teenagers might have roamed the country on delivery carrier bikes and trikes, perhaps dropping off shopping on their way. But it was not to be. By 1955 the ‘mo-ped’ had arrived. And scooters too. They were cool. Delivery bikes were now old fashioned. Most of us have forgotten the duties old bikes performed in times of post-war austerity when motorized vehicles were in short supply. Not only onion sellers and knife-grinders rode bikes for their work, but also chimney sweeps, policemen …and who else? Maybe it’s time to bring out new ‘I Spy’ books to quiz us on what we used to see when Mum and Dad took us into town? Fifty years on, ends of eras inspire nostalgia …and curiosity. Tradesman’s bikes are now less likely to be thrown away. Many folks have started restoring them. With our current economic and ecological concerns, there’s renewed interest in bicycles of all types. 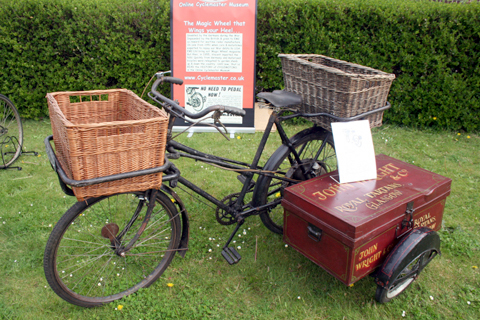 Some restored tradesman’s carrier cycles are sold as mobile advertising boards outside shops and businesses. The World’s petrol obsession is under attack. As a result, work-bikes and trikes are being manufactured again and re-introduced into factories. Businesses are starting to use them too, for local deliveries. 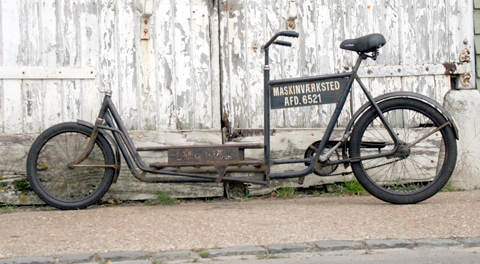 Perhaps its time to get my old Pashley grocery trike out of storage? This museum is a work in progress. It’s a non-commercial website with no adverts. I’m a team of one person working in my spare time, and invariably working on other sites too. I’m not a specialist, just a collector with insomnia who builds websites to pass away the hours. Many trade bikes have no maker’s badge or identification. They’re often the most difficult bikes to identify. There are some design differences that can help (though, confusingly, manufacturers often copied others’ designs). One purpose of this website is to help with identification and age. UPDATE 7th July 2009: My friend Alan B from Worthing lent me his collection of trade bike brochures to photocopy and I’ve now added them to the website, along with all the other brochures I’d been waiting to upload.